This makes a lovely smart vegetarian dinner party main course dish. If you prefer you could serve it with polenta or on a piece of toasted sourdough bread as a starter. 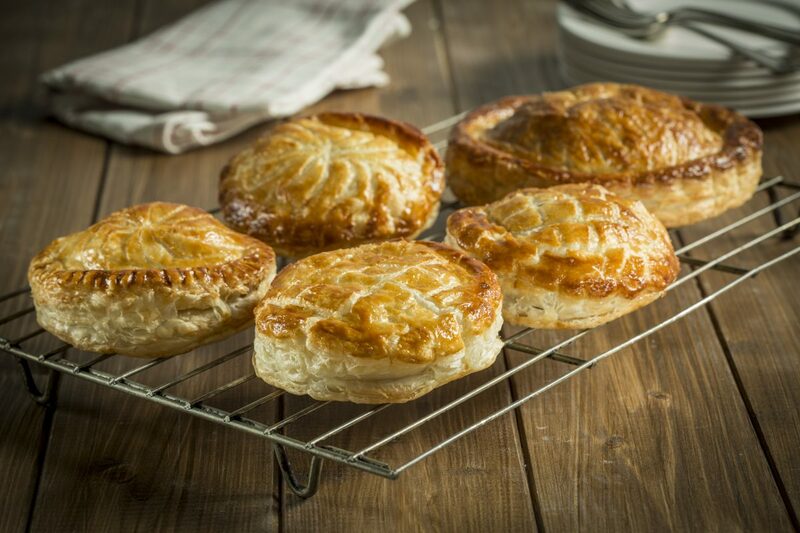 If putting in the pastry make sure there is not too much liquid around the mushrooms – just enough to coat them. If serving with polenta or on toast you may prefer not to reduce the sauce so much. Heat the olive oil in a sauté pan, add the shallots and cook gently for 5 minutes. Add the garlic and cook for another minute. Meanwhile wipe the mushrooms clean and cut into big slices. Drain the porcini and reserve the water. Add all the mushrooms to the pan and cook over a medium heat for 5 minutes or until all the liquid has evaporated. Add the wine, porcini water, tomato puree and mustard. Bring to the boil and reduce to a couple of tablespoons of liquid. Add the sage, thyme and crème fraiche. Bring to the boil again and cook until the sauce just coats the mushrooms. Season with salt and pepper. Allow to cool. Divide the puff pastry into two. Roll one piece into a sheet measuring 22.5 cm x 22.5 cm / 9 inches x 9 inches. Using a template measuring 10 cm / 4 inches in diameter, cut out 4 circles. Roll the second piece of pastry slightly larger than the first one and cut out 4 circles measuring 12.5 cm / 4 ½ inches. Divide the filling into four and put onto the smaller circles, leaving a small border around the edge. Wet the edges with a little water and place the remaining circles of pastry on top of the filling. Carefully press out any air bubbles and seal the edges together. Crimp the edges with finger and thumb and using a blunt knife, mark a criss- cross pattern on the top of the pastry. Put on a baking sheet, Brush with beaten egg and put in the refrigerator for 10 minutes.